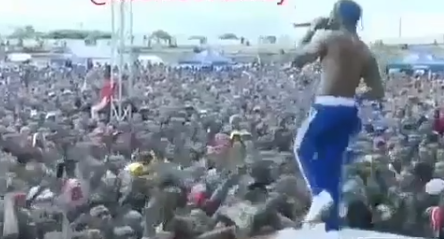 Monday, December 10, 2018- Bongo Fleva star Diamond Platinumz suffered minor injuries on Saturday after a dais collapsed during a sold out show in Sumbawanga, Western Tanzania. Diamond and his Wasafi crew, were entertaining jubilant fans when the dais gave in. From the clip he shared on Instagram, Daimond fell awkwardly followed by Rayvanny as they hyped the crowd by jumping up and down on the wooden stage. His security detail quickly rescued him and he continued the performance albeit a bit shaken.